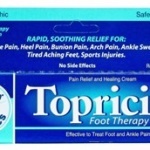 March 8, 2011 — Topricin Pain Relief and Healing Cream, made by Topical BioMedics Inc., has been awarded a patent as a topical treatment of neuropathy. An FDA-regulated homeopathic biomedicine, Topricin was introduced by the company in 1994 and is now a leading natural therapeutic brand, which also received a patent for the treatment of pain associated with fibromyalgia in spring 2010. It is estimated that more than 20 million Americans suffer from neuropathy, which can be debilitating and greatly impact their quality of life. It can occur at any age, but is more common in older adults, and nearly 60 percent of all diabetic patients experience a form of neuropathy. It is estimated that 43 percent of the workforce suffers with neuropathic pain, and lost productivity for active workers costs employers approximately $90 billion. Other symptoms include extreme sensitivity to touch, lack of coordination, muscle weakness or paralysis, and bowel or bladder problems. Sleep disturbance is also a significant issue for those suffering with neuropathic pain, which often leads to an increase in anxiety and depression. There are different causes of neuropathy. Approximately 30 percent of neuropathies are “idiopathic,” or of an unknown cause and another 30 percent stems from diabetes. Neuropathy can also result from such problems as traumatic injuries, autoimmune disorders, tumors, heredity, nutritional imbalances, metabolic problems, and exposure to toxins. Drugs typically prescribed to treat neuropathy can produce serious side effects while introducing additional toxins into the body, adversely impacting the pain sufferer’s quality of life. Side effects of these common drugs include: swelling of the face, lips, and tongue; breathing problems; difficulty walking or controlling muscle movements; nausea; slurred speech; and tremors. Neuropathic pain is often a misfiring of nerve impulses caused by toxins and inflammation around the nerve tissue and surrounding micro-capillary, depriving the nerve of the oxygen it needs to function properly. Without oxygen, cells are destroyed. For healing to take place, the tissue needs to be detoxified and normal blood flow restored. Topricin’s combination of 11 homeopathic biomedicines help the body rebalance healing chemistries needed to detoxify the area around the nerve tissue and restore normal oxygenated blood flow to the area—thus supporting an environment for normal nerve function and the beginning of easing neuropathic pain. Founded in 1994 and headquartered in Rhinebeck, NY, Topical BioMedics, Inc., is the research and development leader in topical regulated natural medicines for pain relief. The company’s family of products includes classic Topricin, Topricin Foot Therapy Cream that addresses painful foot and ankle ailments and conditions, and Topricin Junior for children, which won the Parent Tested/Parent Approved (PTPA™) Seal of Approval in fall 2010. Topricin is available in pharmacies, natural food stores, and other fine retailers nationwide, including Whole Foods, Vitamin Shoppe, Vitamin World, Fred Meyer, Wegmans, and other retail stores, as well as direct from Topical BioMedics. For additional information or to find a store near you, visit www.topricin.com.